Nutty toasted sesame seeds combine with fresh, aromatic ginger root to flavor this tasty Asian dish. The soy sauce and wine contribute to its savory profile, the maple syrup adds a subtly touch of sweetness and the Chinese Five Spice powder lends its five flavors: sour, bitter, sweet, pungent and salty. All these tastes blend beautifully to create a meal that’s easy to put together and tastes fresher and better than take out Chinese! It’s better for you too, of course. 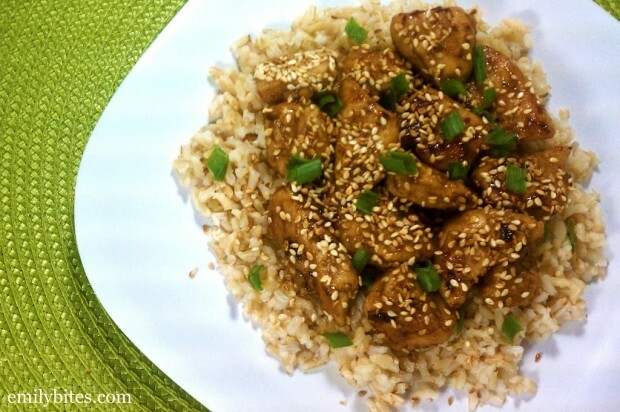 I suggest serving this Ginger Sesame Chicken over ¾ cup of brown rice (per serving) as pictured, but I listed the P+ without the rice as well in case you have alternate plans. In addition to being delicious I also thought this meal was very filling and kept me satisfied for the rest of the evening after eating it. Add a vegetable like broccoli as a side dish (or double the recipe for the sauce and incorporate it right into the meal) to make it even more filling! In a large skillet over medium-high heat, brown the sesame seeds until lightly toasted (2-3 minutes), shaking the pan frequently. Remove toasted seeds from heat and transfer to a dish. Set skillet aside for use in step 4. In a small bowl, combine the water, soy sauce, maple syrup, wine, ginger and five spice and stir together. Place the flour, salt and pepper in a Ziploc bag and shake to mix. Add the chicken pieces and seal. Shake until chicken pieces are thoroughly coated. Add the sesame oil to the large skillet and bring to medium-high heat. When oil is hot, add the chicken pieces and cook through, flipping the chicken to brown on all sides (about 5 minutes). Pour the sauce mixture from step 2 over the chicken and stir to coat. Cook for a few more minutes until sauce is thickened and coating chicken. Add toasted sesame seeds to chicken and stir to coat (or sprinkle seeds over top of each serving). Split chicken into four servings and serve over 3/4 cup cooked rice if desired. I am so making this. Wow, it looks amazing! Thanks for posting it. I made this last night. It was really good and definitely a great alternative to getting take out sesame chicken! YUM! Unfortunately, I thought I had sesame seeds but I didn’t. 🙁 But hey, at least without them it saved me a point! And I did have sesame oil to compensate. Just made this recipe & love it! I added a slash of orange juice for tartness & red pepper flakes because I love spice. Also used a bit of cornstarch to help thicken up the sauce. Love this recipe & will definitely be having it again. Thanks Emily! Ooh, those sound like yummy changes. Glad you liked it! Made this tonight for dinner. My chicken didn’t turn out that brown though. Maybe because i added broccoli and bok choy in the same pan. Pretty good! I’ve never had chinese 5 spice. Made this tonight exactly as written – wow! Delicious! 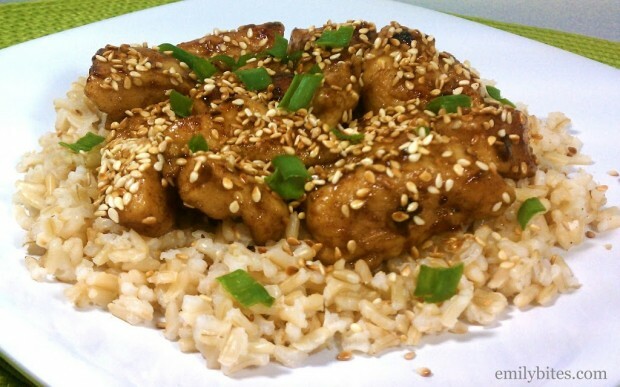 I liked it better than takeout sesame chicken which is always so starchy, sticky and sweet. Hubby liked it too. Thanks so much! Made this tonight, followed exactly and found it to be very bland. But I love Sesame chicken so I’m willing to try again with the addition mentioned above of the orange juice and red pepper to see how it comes out. Sorry you didn’t like it, Miranda! You will find these standard abbreviations used in many recipes online or in cookbooks. what kind of dry wine? red or white, or does it not matter? Where do you find light maple syrup? What is the difference between light and regular maple syrup? My parents make their own maple syrup, and we’re all scratching our heads. Should I substitute real maple syrup or the light “fake” stuff? Thanks so much for your help! I meant the fake stuff, but feel free to use the real kind if you prefer! It will change the nutrition info. Could the dry wine be substituted for anything else? Do you think that white wine vinegar would completely change the taste?